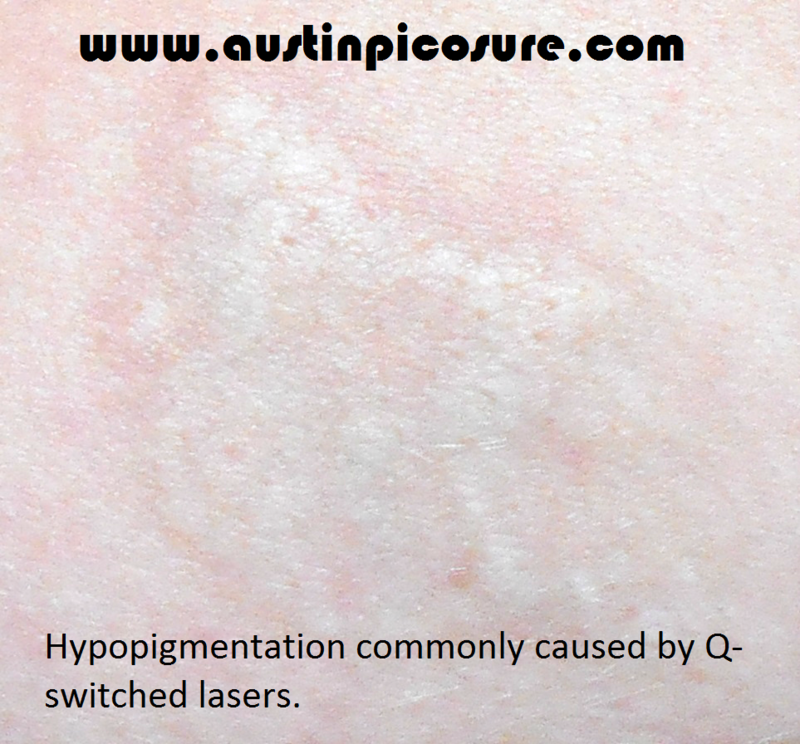 I often have patients come to me for PicoSure Laser Tattoo Removal who have been left with permanent hypopigmentation due to over-treatment with a POS q-switched laser. In addition to their skin becoming permanently lighter, they are also often scarred and left with tons of unsightly residual ink called a “tattoo remnant”. Once the ink is completely removed with PicoSure, the hypopigmentation caused by the POS may become even more apparent (see example below). Many times hypopigmentation is transient and will ultimately resolve on its own but sometimes a good physician can help speed up the process. There are certain treatments that can stimulate melanin production, such as medication and even additional laser treatments at specific wavelengths. One such medication is called bimatoprost and it’s the key ingredient in products such as Latisse. Latisse is used to make eyelashes grow longer and darker in patients who are not satisfied with their lashes. Unfortunately bimatoprost can be pricey in the U.S., where we often pay triple or quadruple what other countries pay for their drugs. A board-certified dermatologist can help decide what treatment options will best reverse your hypopigmentation. In the meantime, if you’ve been left with a scarred, hypopigmented tattoo remnant that you would like removed once and for all, safely and effectively with PicoSure, I can be reached by phone @ 512-479-9997 or just stop by my NEW location in Austin, TX: Austin Medspa on W. 6th St.